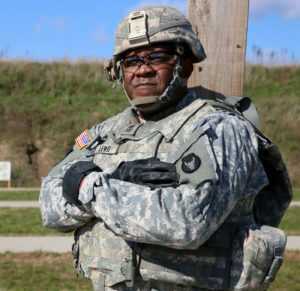 A 37-year veteran of the Iowa Army National has become the first African-American promoted to the rank of Sergeant Major in the organization. Sergeant Major is the highest enlisted rank you can reach without becoming an officer. Lewis is a 54-year-old medic who has worked for the guard full time for 15 years. As Sergeant Major he will now assumes the duties of chief operations sergeant, 109th Multifunctional Medical Battalion (MMB), located in Iowa City. Lewis says becoming the first African-American to achieve this rank is important. “I think what it does to me, it holds that people of color…either women, minorities, people who have different ethnic backgrounds, different beliefs, can become a sergeant major,” according to Lewis. While he is proud of making history, he doesn’t think it puts any more pressure on him as a role model for others. when I was a private as a sergeant major,” Lewis says. “And that is to take care of everyone below me and make sure I follow the rules and regulations the military puts out for me.” Lewis has deployed twice, supporting Operation Desert Storm with the 209th Area Support Medical Company and Operation Iraqi Freedom with the 134th Ground Ambulance Company. He says you sometimes see soldiers in the worst of times as a medic — but he finds the job rewarding. “You see the good and the bad. But the reward is you do see the bad and you see someone and if you save their life and they recover, that is the reward out of it,”Lewis says. Lewis says he has seen the Iowa National Guard improve since the time he first joined in 1981. He has two more sergeant major steps in rank above him and he says he would like to continue up the command chain to one day become the Command Sergeant Major.